A call to the Erie Police Department comes back with the number of guns taken off the streets in the last few years. The Philadelphia Police Department releases annual reports on its website that show the number of shooting victims and homicide by firearm. In Reading, they’re focusing on the locations of verified shots fired in the city. Each police force collects a lot of the same information, but they can highlight specialized information that they think gives the best picture of what’s going on in their respective communities. That’s not uniform across municipalities. The only place for detailed picture data on crime in the United States is the FBI’s Uniform Crime Reporting system, or UCR. However, some say it’s not the best system, because each state and municipality has its own standards for reporting crimes (making it, in fact, not so uniform). For example, an aggravated assault in one jurisdiction might be called a simple assault in another. In Lancaster, Lieutenant Todd Umstead started keeping a running total on a notepad by his desk of the number of people actually hurt in shootings, because that wasn’t clear just by looking at the UCR. Umstead said he realized this after a reporter came looking for statistics on shootings in the city, and the number recorded seemed much too high. The Pennsylvania State Police’s UCR may give a better picture for the commonwealth. That database can be searched online by police department and offense. Assaults, robberies and homicides can be broken down by what weapon was used in those crimes. It can be difficult to compare municipalities, however, because only about three percent of departments in PA are using more specific “incident based” reporting, which has 46 categories of crime. The rest are using “summary based” reporting, which has only eight categories of crime. Dane Merryman with the Pennsylvania Chiefs of Police Association said, because of budget tightening, a lot of smaller departments just don’t have the capability to do more than the minimum required by the UCR. “It is always going to be a funding issue for departments to replace existing systems and upgrade their data capabilities, so it’s going to be a long-term process,” Merryman said. Police in the City of Harrisburg are more than familiar with budget challenges. They saw a drawdown of officers before the city entered the state’s Act 47 program for distressed communities in 2010. Captain Gabriel Olivera said having fewer officers creates a need to police smarter. With help from a grant from the Dauphin County District Attorney’s office, the department launched a new records management system in November. The previous system was over 20 years old and cumbersome. Olivera said the data on firearm-related offenses is all in the system, but to get to it, he had search for individual UCR codes and manually count the crimes. Harrisburg officers are still learning how to use the new system, and Olivera said when the training period is over, the clearer data will help them form a new plan to reduce crime. Five additional officers hired last year with a federal Community Oriented Policing Services (COPS) grant will be sent to patrol the newly identified high-crime areas of the city. Olivera said he hopes that when residents see what crimes are happening in their neighborhoods, they will take a greater responsibility in putting an end to them. Some people have doubts having better crime numbers will actually make a difference. 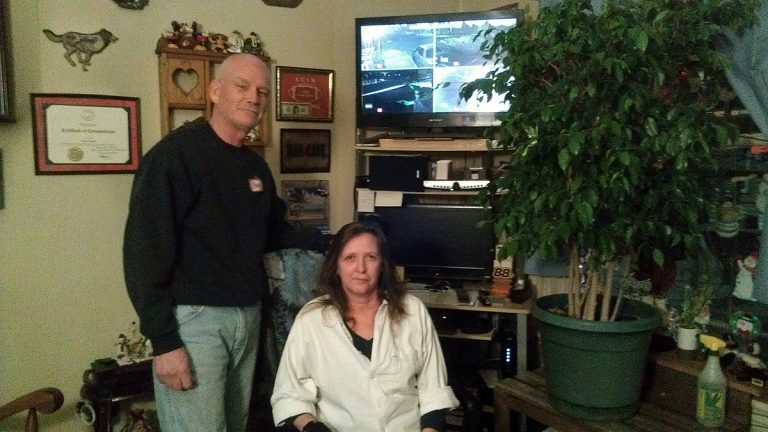 Jeremy Domenico and his wife Jenniene are block captains on their street in South Allison Hill in Harrisburg, and they said the police might not be able to get a definitive picture of crime from data, because a lot of crimes go unreported. “Our neighbor across the street had a shotgun pulled on him. He’s not reporting that. The people behind us had a pistol pulled on him, he’s not reporting that,” Jeremy Domenico said. The Domenicos said that while they understand the department is short on manpower, they would like to see more officers walking around their neighborhood and engaging with the community. They also said they’ve seen a change on their block just by cleaning up and reaching out. “We found that if you just show up and treat everybody as if they have value, things stop happening,” Domenico said. The couple said the better data might help, but for now they can get a picture of gun crime on their street just by looking out their front window.